Surveys show that a Republican majority in the House was swept into Congress by voters concerned about the federal deficit, confused about health care reform and angry about the economy, but most especially about the lack of jobs. Repeatedly, they said their top priority was jobs. If that was a mandate, the next election may well be decided by the voters’ perceptions of who is more likely to create jobs. Job creation certainly has not been the new majority’s first priority. That was to repeal the health care reform. By putting the adjective job-killing in front of the repeal bill’s name, some may have hoped that voters would mistake their ideological mission of destruction for an idea to create jobs. But it would have created not one job. And even the adjective was false. Health care, in fact, is the only sector of the U.S. economy that has steadily created jobs throughout the recession; and the reform, which will bring some 30 million new customers to insurance companies and into doctors’ care, would surely create jobs, not kill them. 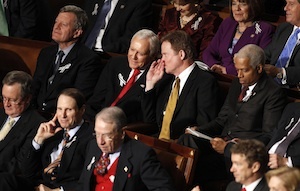 How will the 112th Congress create jobs? It is hard to say, but it will take more than merely “undoing” the initiatives of the last Congress. Already some lawmakers are taking the Environmental Protection Agency to task, even though the agency saves lives by working to ensure that corporations do not foul the atmosphere or the nation’s waters and land. The assault will do nothing to create jobs and could impede job creation efforts already in motion. The government already has sponsored clean-energy initiatives for entrepreneurs; has begun to woo the auto industry away from its oil dependence and toward higher-mileage vehicles, hybrids and electric cars; and has budgeted for public transportation initiatives like high-speed rail projects and other infrastructure improvements. All of these initiatives will put Americans to work. The 111th Congress saw to that. But where are the job creation strategies of the 112th Congress? According to recent studies, the president has underestimated the shabby state of learning in both the high schools and colleges of the country. In New York State only half the high school graduates—in New York City only 23 percent—are ready for college or careers. A new book, Academically Adrift: Limited Learning on College Campuses, reports that according to a study of 2,000 students in 24 four-year colleges across the country, U.S. colleges are falling behind world competition because the students cannot write. It is possible to get a degree in business or education, the two most popular majors, without doing much writing. In 10 selected public four-year colleges, out of 41 courses required for an education degree, fewer than four courses required future teachers to write 10 to 19 pages a semester, or at most 1.3 pages week. Nationally, students spend on average about 12 hours a week studying outside the classroom, and one-third spend under five. Teachers who answer President Obama’s challenge must enter the classroom armed with Thoreau, Hemingway, Joan Didion and E. B. White. They must risk displeasing their own students and require them to read and write. The 2-year-old boy was baptized Antoine Joseph on May 6, 1798. On that day his godparents, Marie Joseph and Antonio, accompanied his mother, a slave woman known only as Manon, to St. Louis Cathedral in New Orleans. These names were recorded in ink in the baptismal records of the archdiocese. On Feb. 1 the name of Antoine Joseph was among those made available in another format—the online records of the Archdiocesan Office of Archives. The first five registers, written in Spanish, now on the office’s Web site include the baptismal records of slaves and free people of color in New Orleans from 1777 to 1801. They can be accessed by anyone from anywhere. The pages are difficult to decipher without the help of additional records, and the process of scanning and preserving the pages was an expensive, painstaking and time-consuming endeavor. Despite this, the project is a worthy one, and not simply for research purposes. The archdiocese saw the launch as an opportunity to recognize the integral role of African-American Catholics in building the city of New Orleans and the church, and to recognize by name some of the thousands of otherwise anonymous slaves. It was also a chance for Archbishop Gregory Aymond to offer an apology on behalf of the church for the fact that the church and some religious orders owned slaves at the time. The publication of these records is also a small but worthwhile step toward the transparency many long for in today’s church. It is a reminder that, though the church may move slowly, it is also an institution capable of admitting its wrongs, learning from its history and moving forward with grace. Clearly it not the intention of the Republicans to create good paying, well benefited jobs. If anything, they espouse part-time, at will, and minimum wage employment, which is temporary and subject always to the whim of the employer. There is even an all out attack on unionized jobs, especially in the public sector, which is an obvious effort at union-busting and destruction of even existing collective bargaining agreements (a la Wisconsin). When it is also so obvious that we need stability in employment, living wage jobs, and security in benefits such as health care and pensions, the Republicans are methodically ridiculing even our aspirations. We need desperately a new form of WPA and CCC programs to put people back to work in dignified occupations and doing needed work to rebuild our infrastructure, schools, public faciities, parks and transportation systems. The Republicans want none of that on Obama's watch. Will we never learn? Government does not create jobs, the private sector does. This has been the slowest recovery from a recession since the thirties. Businesses are cautious as they watch a president threaten big increases in taxes and see him demagogue one industry after another. Clean energy jobs, who are you kidding. GE just closed the last factory in the U. S. to make incandescent light bulbs.All those new bulbs with the poisinous mercury in them are made in China. The premier of Ontario just quietly announced that they will not promote fresh water wind farms any longer. They don't make sense. Nuclear power would but that makes too much sense. Among the "some" slave-owning religious orders was the Society of Jesus. Two things are absolutely essential to good writing skills - reading and clear thinking. As for reading, most students are not encouraged to do very much of it. A cantankerous literature professor of mine once asked a room full of English majors (juniors and seniors) at a liberal arts college that had a very strong core curriculum how many had read Aristotle's Poetics, or portions of it. It had been, along with other classics of Greek and Roman literature, required reading for me during freshman year. I think I and one or two other students raised our hands, to which my professor responded: "You people are dumb!" A little harsh, to be sure, but unfortunately not far from the truth. That was at an excellent university in f1985; I think the the situation has only gotten worse. As for clear thinking, we do very little if any of it before putting words to email, to Blackberry, to computer screen, or to paper. It's often more important to "put something out there" than to trouble ourselves with either facts or the quality of content. "Job creation has certainly not been the new majority's first priority." The new majority would take issue with that, as they conclude that the health care bill will cost jobs by adding huge numbers to the deficit and eventually creating a public health care system every bit as excellent and cost-effective as our public education system and Amtrack. But one thing we all can agree upon, the Obama administration and the recent complete control of the House and Senate by democrats certainly didn't consider job creation its first priority. Rather President Obama's priority was locking Pelosi and Reid behind closed doors and ramming through what most, including the American public, considered to be a poor health bill. Now we are reaping the consequences of their priorities. Yikes. That last paragraph is a doozy. The 111 th Congress created jobs by "sponsoring" (meaning heavily subsidizing) clean-every initatives: has begun to woo the auto industry away from its oil dependence and toward hi9gher-mileage vehicles, hybrids and electric cars; and has budgeted for transportation like high-speed rail projecta and other infrastructure improvements. Is this not the old Soviet Central Planning model resurrected? In the 1960s it sounded great. Wise, all-knowing elites could plan every aspect of complex economy. Governemnt central planning by the Soviets turned out to be a multi-decade disaster. Shortage of bsic goodds like food, hjousing and clothes everywhere while abundances of tractors and other machinery and industrial goods that noone needed. The holy Democratic party can do not better than the Soviets. Government planning is good intentions but disasterously poor results. The esencial problem with government planning is it ignores the real demand and needs of people and goes off and tries to impose the will of the central planner on society. Central planning is market free planning by motivated by political ideology and needs rather than market that want needed economic goods or services. Jimmy Carter had about the same agenda in the 1970s. But Democrats make very poor market executives. Amtrak the ogvernemnt passenger rail monopoly for decades. In an era of cars, planes and buses few people use this heavily subsidized service - There is no demand for slow or fast moving trains that only go to certain destinations at certain times. The government planners can invest in rail infinitely but noone cares So accordingly there is no possibility of hiring more people for jobs. When will the editors of America learn it takes real demand to create real jobs? No wishful government programs? The private sector is where rreal permanent jobs are created not highly subzidized public unproven public initative. If these initative had any real potential captial from around the world would pour into these projects. Goverment economic programs as a job creater is a bogus concept that died with the new Deal and theeconomic collapse of the Soviet Union. This article also appeared in print, under the headline "Current Comment," in the February 28, 2011 issue. Pope Francis prayed for victims of the attacks in Sri Lanka and called for peace, highlighting 18 conflicts around the world.